Thomas Mitchell`s aboriginal guide on the1846 exploration to Queensland, Yuranigh, died at Gamboola Station in 1850. The grave is marked by 4 carved trees surrounded by a fence erected by the government at Mitchell`s request. It was replaced with marble slab in 1900. On 15th December, 1845, Sir Thomas Mitchell left Boree on the last of four expeditions to explore eastern Australia. Accompanying the party were three Aboriginals. One of these, Yuranigh, was to prove himself indispensable to the expedition with his bushcraft skills. After the expedition, Yuranigh returned to Sydney with Mitchell, but he soon tired of the city. After a brief spell as stockman on a northern cattle station, he returned to Boree. He died there in 1850 and was buried by his people who also put inscriptions on four yellow box trees near his grave. In March, 1852, Sir Thomas Mitchell asked the government to erect a fence around the grave and he supplied a stone with a suitable inscription. 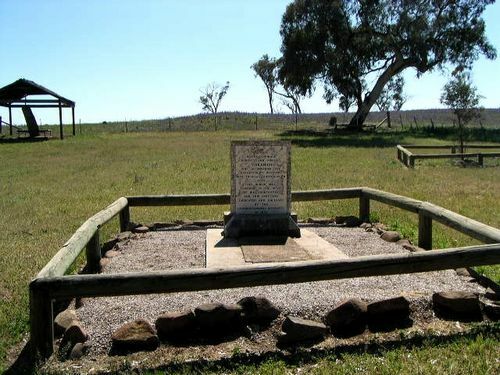 In 1900 the gravestone was re-erected by the government on a new base on Molong marble. In 1908 the headstone was replaced at the insistence of New South Wales Premier Carruthers who had visited the site and the inscription was copied from the old headstone. The monument is now a dedicated reserve. According To The Rites Of His Countrymen And This Spot Was Dedicated And Enclosed By The Governor General`s Authority In 1852.